This is a showstopper. Everyone who comes over asks me about this lovely statuette. I have it sitting by my fireplace, looking over the room. It’s perfect. Standing almost two feet tall, our large-scale, display-quality sculpture honors the ancient Egyptian goddess Bastet, said to be the protector of women and the giver of joy. Finely sculpted and cast in quality designer resin, this replica work of antiquity is hand-painted in faux gold-tones to honor the goddess credited with ruling the sun&apos;s warmth and life-giving power. 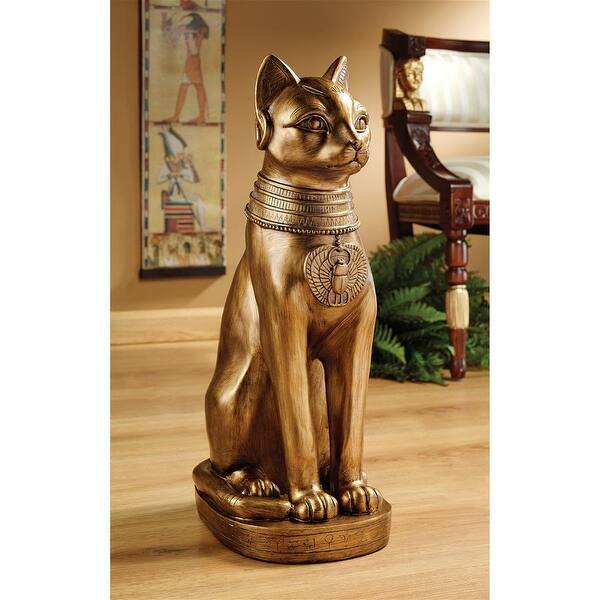 Our Design Toscano-exclusive figurine makes an exotic gift for a cat lover or for your favorite Egyptophile. 7"Wx11"Dx21"H. 8 lbs.